Mankind was on a vast population increase and had some serious food shortages because of that and in an attempt to solve the problem, the scientists created a new species to use for food, and place the herd in northern Japan, but in time, the creatures mutate, referred to as "ruffians", and attack the people of Japan. An international peacekeeping organization called the "Armed Volunteers" tries to stop the creatures but they also oppress the Japanese... now a group called the "Savior Group", led by a mysterious woman named Achi, rises up to defend Japan against the Ruffians and Armed Volunteers. First of all... it's confusing, the whole story is okay at best, but there are some things that are not explained in the game, I mean sure the setting behind it is on a fictional earth, but that doesn't mean that I should just accept it like that and not asking any questions, and in the end, you will just get confused because you will not understand several things that this game is supposed to be showing you. 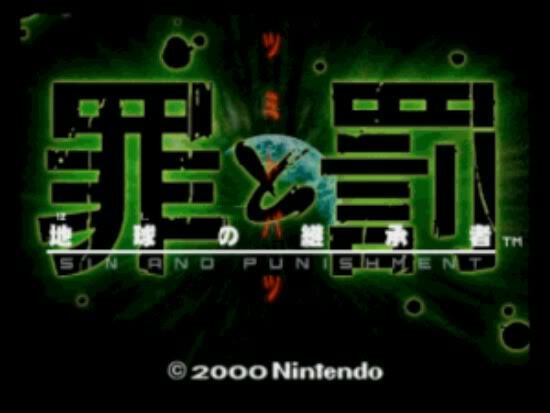 Sin & Punishment (also known as "Sin and Punishment: Successor of the Earth" in Japan) is a rail shooter where you only use the classic controller and the gamecube controller. The game progresses through this "Corridor Mode" which forces your character go on a fixed path straight forward through the environment and you can't stop no matter what you do, pretty much just like in the Star Fox 64 for the N64, but this time you're on the ground and you can jump. The game is a shoot em' up in which focuses to have a lot of enemies on the screen and also some obstacles on you way as well, and all you do is aim and fire at enemies, sidestep, roll, jump, or double-jump to avoid attacks and obstacles, there are two ways of attacking which is with a gun where you shoot it like a machine gun and you have infinite ammunition, and you can aim with a reticle with the control stick, but you can also switch between manual (where you can control the reticle) and lock-on (where the you must point at an enemy and then the reticle will automatically aim itself to enemy) firing modes at any time by pressing the A button, however the problem is that Lock-on mode is less damaging than manually-aimed fire, and aiming the reticle is really slow which is pretty bad considering that the game is a little fast paced. And then your other attacking method is with an energy sword which is very powerful but you can only attack in close combat or when the enemy gets closer to you and you can also bounce back projectiles with it which can potentially inflict great damage on opponents, but the problem is that you can use the sword with the same button you use to shoot, you can tap the L button to use the sword and hold it down to use your gun, and it is very uncomfortable to do so, and not to forgot to mention that the game has some very uncomfortable controls, there is an option to change the controls in 3 different control settings, but the thing is, you might get used to default option and you might end up getting messed up with control issues. One thing that I've mentioned is that there is obstacles that you can and must evade, and they range from pits to walls to objects that can hurt you, making this game a little bit of a platformer. 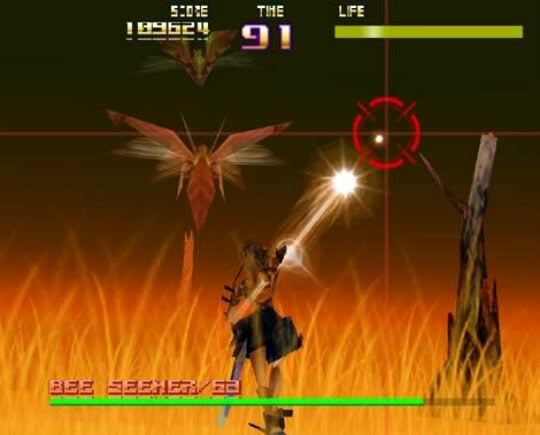 The game also has a health meter as well, crash on a wall or get hit a lot of times you will lose health, and to get more health you must collect the health item in order to restore some of it, but the item doesn't appear to often, so you must keep pushing forward until you eventually find one. Another thing to mention is that there is a timer at the top of the screen and once the timer hits 0, you gradually lose more and more life until you die and so you must refill the timer by either getting a bonus kill or collect the time powerup. 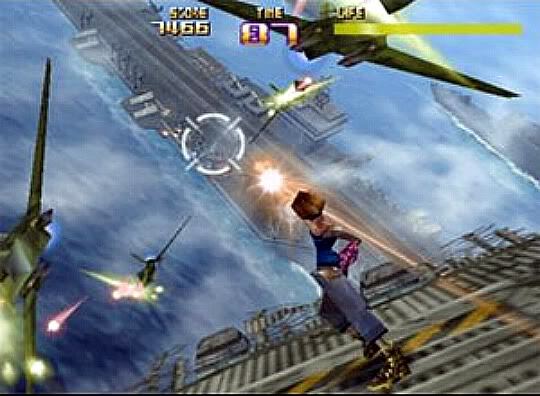 The game focuses more on getting the highest score, and that's why the game throws you a lot of enemies and shootable objects in order to keep the score rising, and there are other ways to get a lot more points, like how there are some bonus targets that you can shoot or slash at and you must uncover them by doing a certain activity, and then there's also the points powerup where you get more points, keep collecting them in a row and it's value will increase. One unique thing about this game is that it changes the style of progressing through the game, for example in one instance where in one level you just only stand the and you can't go forward and the only thing you do is shoot and slash until you survive, and another instance where one level feels like a platformer, this game has some variety when it comes to the styles progressing through it so I'll give some good points for it. The game is divided by chapters and you control a certain character in a certain chapter, there's a menu where you can look at each chapter and each of them have their own sub chapter, and also a few demos where it's just the cutscenes. When it come to difficulty, this game ranges from a little challenging to fairly challenging, but that's because of the slow aiming, otherwise it would've been enjoyable, but you can actually play the levels over and over in order to be good at it, so the difficulty in this game is pretty well balanced with skill, and not to mention that there are mini bosses everywhere ! there are bosses at the end of the levels, but there are a few mini bosses in each level, and they can range from hard to very easy, depending on how are you going to destroy them. If it wasn't for the uncomfortable controls and some really annoying moments, it could've been a lot more enjoyable but as it's stands, at least it's decent for me. The game looks ok, the environments look alright and some character models look ok as well, but everything looks kind of muddy and dark sometimes, not to mention that other character models look kind of bad, I know that this game is a N64 game, but this game was released back in the year 2000, and even Zelda: ocarina of time, which was released in 1998, had good looking character models than in this one, and not to mention that the game shows it's age when it comes to technical related things (specially in the cutscenes), but as it is, the game looks ok. The sounds are good though, even though you don't make a noise when you are shooting the gun, they're very comfortable to hear because they sound very appropriate for them each time something is happening, as for the voice acting... sometimes it's not bad, but sometimes it is bad, the voices sound kind of monotone to the point that they don't sound like they have an emotion whatsoever, not to mention that there is some instances that the dialog progresses too quickly that it will sometimes play a voice clip over to another voice clip that was about to finish it's speech, and it can get annoying sometimes. The game has english voice acting but with japanese subtitles, so there is no other language other than that. The game actually has some multiplayer included in it, but instead of playing two or four separate players, the only thing it has is that only two players can control one character cooperatively, meaning that the second player can control the targeting sight and shoot while the first player controls the character's movement, even though this sounds ridiculous, it is actually pretty fun to do ! 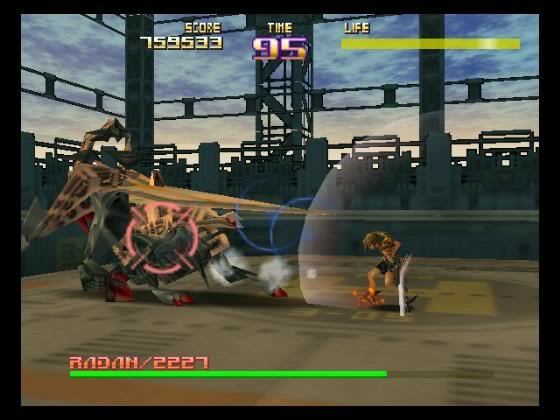 As for the replayability, there's nothing much to it other than completing the game in a certain difficulty in order to unlock some options like a music test, turning on and off subtitles, a hard mode, but some of them are very interesting, like a frame skip option, where once activated, it will disables the game's slowdown function, and Insane turbo where it will make the game will move twice as fast as normal, and you can also go for a higher score for all the levels (but not each of them have their own score), and you can also replay the levels in the chapters menu where you can even see the cutscenes as well, but the problem is that once you die in a level just once, you will be taking back to the chapters menu, no questions asked. The game costs 1200 Nintendo points in the Wii shop channel, to be honest, even though this is an import game from japan, it still feels a little overpriced in my opinion. Nice review Jnes5, I agree with your score this game is highly overrated, but is still a decent game. Yeah, usually titles that don't see localization become overrated for some odd reason. I guess it has something to do with wanting something that you can't have. I don't see Xenoblade Chronicles being better than Skyward Sword if you what I'm saying, as I'm actually anticipating the arrival of Last Story. I like this game but man it is hard. I felt like throwing my gamecube controller through my tv screen at times.....well whatever hmph you did a good job with this review Jnes5. I am disappointed that this game didn't live up to the hype it received, but it's still fun. Jnes5 always does such a great job with his reviews! How hard is Sin and Punishment compared to its Wii sequel? @Megatron2000 wrote: How hard is Sin and Punishment compared to its Wii sequel? Both of them are hard in their own way, thanks to this game's sluggish controls and the sequel "kind of" raised it's difficulty since you can aim better in that game.